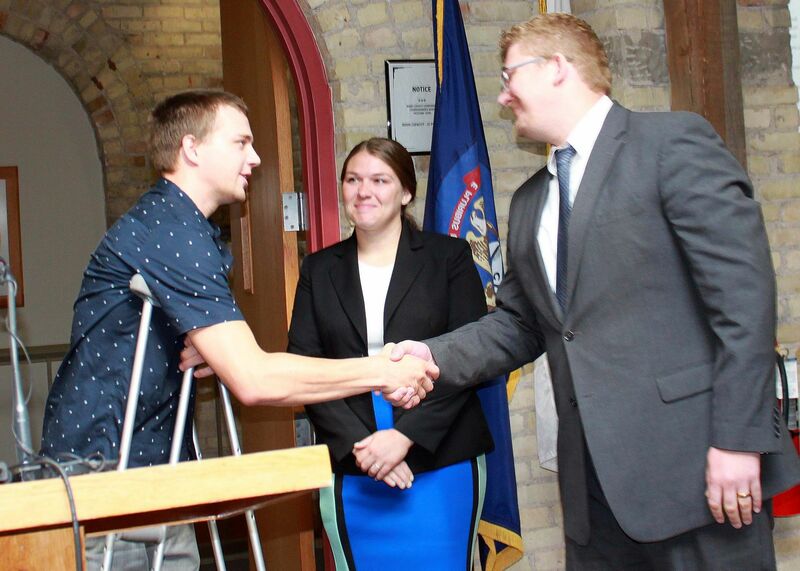 At a ceremony at the Barry County Commissioners meeting Tuesday, Barry County Undersheriff Matt Houchlei honored four people who helped save the life of Cameron Cichosz after he was struck by a boat on Gun Lake. Houchlei released this statement after the awards: “Today, the Barry County Sheriff’s Office and the County of Barry are honored to be able to present very special citizen awards to Dr. Lauren Azevedo, Dr. Ryan Keating, Orangeville Fire Chief Matt Ribble, and Captain Mike Swift. “Many of us will at some point in our lives encounter a moment where a crisis is unfolding. Each of us may choose to respond differently to that crisis, depending on our training, abilities and experience. “On June 17, 2018, a chain of events occurred on Gun Lake that saw Dr. Azevedo, Dr. Keating, Chief Ribble and Captain Swift take action when needed. Today, we wish to honor these four citizens who intervened in an unfortunate situation that literally was unfolding in front of them by jumping from their boat and personal watercraft to render first aid to an injured boater. 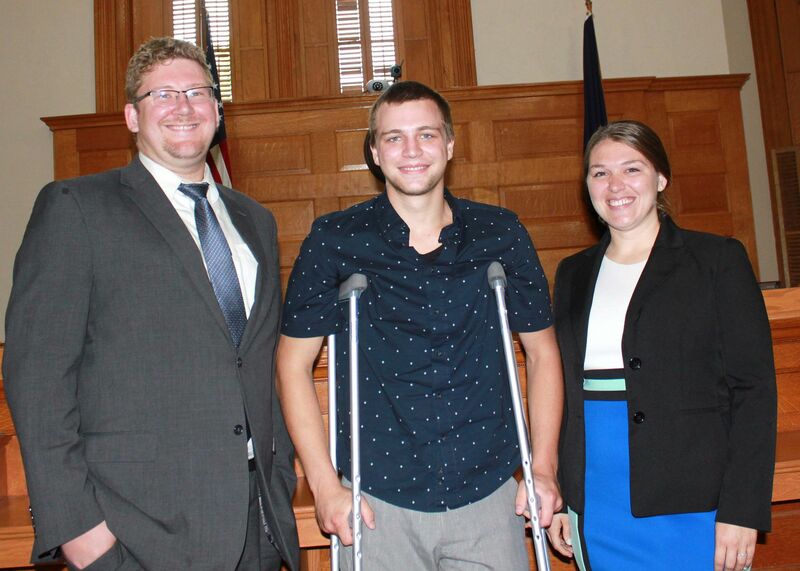 “By doing so, these individuals in front of you today saved the life of Cameron Cichosz. Photos (upper left) Dr. Lauren Azevedo and Dr. Ryan Keating stand with Cameron Cichosz after receiving Barry County Sheriff’s Citizen Life Saving Awards. Orangeville Fire Chief Matt Ribble and Captain Mike Swift were unavailable for photos. (middle right) Cameron Cichosz thanks Drs. Ryan Keating and Lauren Azevedo for helping save his life. 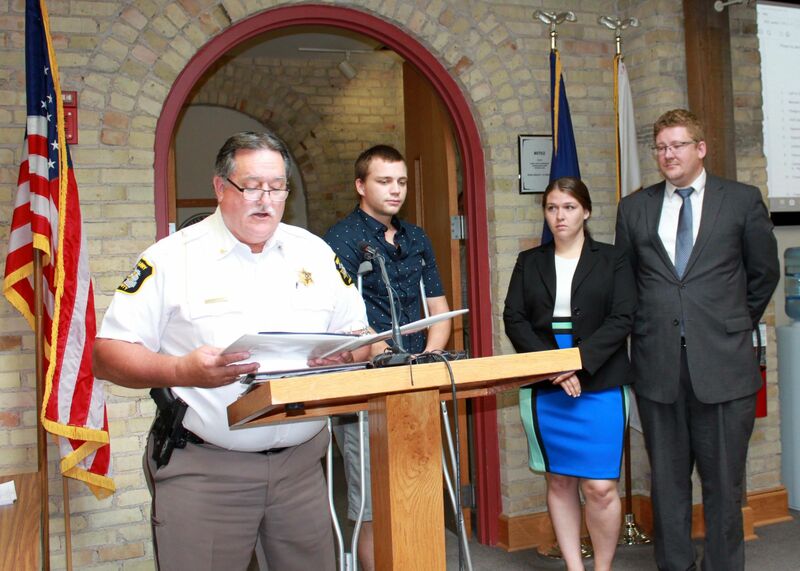 (left) Barry County Undersheriff Matt Houchlei reads the Citizen Life Saving Awards to Dr. Lauren Azevedo and Dr. Ryan Keating (far right) awarded for saving the life of Cameron Cichosz (behind Houchlei).